TPR Media continue their support for the crazy upcoming 2013 season! Home » TPR Media continue their support for the crazy upcoming 2013 season! I met Scott from TPR Media in late 2010 through my very good friend Rob Whyte. Since early 2011 Scott and TPR Media have been an integral part of what I have acheived so far. This website you’re looking at is thanks to the TPR team and Scott has been at almost every event since we met to take photos and be part of the fun we have every time we head out to the track. 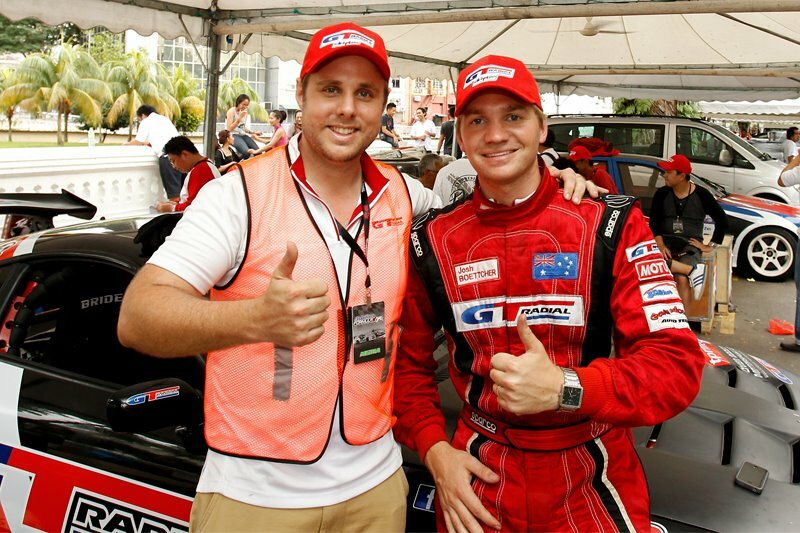 Above is a great shot of Scott and I in the middle of Kuala Lumpur, Malaysia for the final round of the 2011 Formula Drift Asia series when I had just found out I had become Rookie of the Year and Scott was enjoying photographing his first ever Formula Drift event! I’m proud to announce, that this season we will be continuing our great partnership and take on even more awesome events than before! Our most recent stop was the Top Gear Festival in Sydney last weekend! It was an amazing event with huge crowds, too much to see and do in only one weekend and heaps of track time for us to let loose during our drift demos! The best news from the event was finding out there will be a ‘Top Gear Special’ episode coming out later in the year all about this event, so we are hoping to make the cut! I’ll have a full wrap up of pics and a video from the event in the coming days. So when you are looking for professional Brisbane web design, make sure you check out my good friends at TPR Media. TPR Media are based in Brisbane, Australia and provide marketing services including Search Engine Optimisation (SEO), Social Media Managment, web development, flash animation, professional photography, graphic design, printing and email marketing to name a few.